Mamizou Futatsuiwa (二ッ岩　マミゾウ, Futatsuiwa Mamizou) is a Bake-danuki, summoned by Nue Houjuu who originally lived in Sado in the Outside World in order to act as the Myouren Temple's trump card against the newly-arrived residents of the Hall of Dreams' Great Mausoleum, particularly Toyosatomimi no Miko. She is able to morph both herself and other creatures into different forms and can disguise herself as a human. Mamizou first appeared as the Extra stage boss of Ten Desires. She then appeared as a playable character of Hopeless Masquerade, she was a 6th and 8th Day Boss of Impossible Spell Card and a Playable Character in Urban Legend in Limbo and Antinomy of Common Flowers. She is a recurring character in Forbidden Scrollery. She is a bake-danuki of proper lineage, and a youkai of the Outside World who has been called over by Nue Houjuu (by her own judgement) as a means of resistance since the Saint who sings of youkai extermination, Toyosatomimi no Miko, revived. After the quarrel, she started living in the Myouren Temple. She was originally from Sado along with the humans there, and before the events of Ten Desires' Extra stage, passed through the Great Hakurei Barrier to enter Gensokyo. Mamizou, proud of her race's esteem, is good natured, albeit with a mischievous streak. She speaks the way an old lady might, and occasionally squints as if she was nearsighted. She isn't one to take a grudge, but as Marisa Kirisame in her extra stage shows she has her limits of niceness. She does enjoy pulling pranks on humans and watching them be confused and flustered. Perhaps because in the latter half of Ten Desires, there were many characters who engage in things while they actually had ulterior motives, in one part, it can be said "Mamizou is the conscience of this game." In the game, she talked in a light friendly way, and because the way she spoke indicated "training", it seems that she currently is very confident in her power as a youkai. Her first person pronoun is "washi" (儂), which is entirely an old person's way of speaking. Nevertheless, this seems to be her way of saying things, and not so much because a belief of having aged. Since the bake-danuki who showed up in Oriental Sacred Place also used "washi", it might just be that all tanuki use old people's way of speaking. Despite being brought in as a 'trump card', she is noted as being friendly with humans, and has been seen taking on the form of a human while in the Human Village. 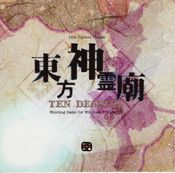 According to the omake text of Ten Desires, "sometimes she'd trick them, but she'd also lend money to the poor and worked diligently on any task she was given, so she integrated well into human society", showing that she is reliable and kind at heart. Though she is seen in the Human Village often in human form, Symposium of Post-mysticism has stated that she does not make an effort to hide her tail, considering it a mark of her high status. However, she doesn't get along with kitsune, and in Symposium of Post-mysticism, Mamizou says that Sado is a country entirely of bake-danuki, and not a single fox can be found there. It's said that if she encounters one, there will be trouble. This is the ability to disguise things (including herself). Similar to Nue Houjuu's ability, it is an ability to make the appearance of things different from what they looked like originally. As opposed to Nue who relies on how humans recognizes how it appears, Mamizou depends on her own conception. 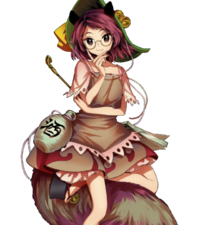 Mamizou is able to completely disguise herself save for her large tail and her ears, which appears to be a commonality among all bake-danuki. In order to get around this, she can shrink them or camouflage them, but if she is surprised or excited her ears and tail will twitch, making it a dead giveaway. Another give away would be her smell. Her disguising abilities gain power on nights of the full moon. Since tanuki like to do things like disguising people to take on a bewildering look, they rarely do inflict direct damage. The meaning of 'disguising things' is something that resembles the fellow nue, and thus mutually, they do not appear to play the role of close-range combat youkai. Thus it is a possibility that Nue has called Mamizou over with the consideration that "since the opponent can hear ten people's conversations at the same time, one has no choice but to call over a suitable youkai for splitting into 10 + 1 = 11." She is also able to disguise other objects. However, if there is no resemblance between the base object and the disguised one, it will probably be seen through immediately, especially in regard to creatures. While the ability is described as a simple disguise, it isn't a mere illusion and actually influences and changes the physical properties of the target. For instance, in Hopeless Masquerade, she can turn the opponent into something completely harmless, and her underlings seem to obtain the properties of whatever they transform into, becoming able to attack by blowing steam after they tranform into a giant teapot. Mamizou possesses the ability to travel in and out of Gensokyo, but the mechanism she uses to do this has not been explained. 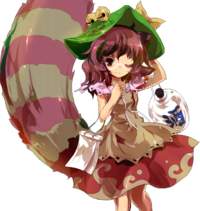 Mamizou's role is to become a strong ally in the youkai forces. She did provide loans and other assistance to humans in her pre-Gensokyo days. Due to sayings from her specifications and sayings that indicate that she has bad relations with kitsune, Mamizou is probably based on Japan's three famous tanuki, Danzaburou-danuki of Sado Island, one of the most famous tanuki in Japanese folklore, along with Hage Danuki of Yashima and Shibaemon Tanuki of Awaji Island. He was the boss of tanuki on Sado, who drove off the foxes from the island. In another, Danzaburo was a money lender, who freely loaned money to the people. He was also said to be responsible for mirages at Futatsu-iwa, a rock formation in Aikawa, Sado. Those tanuki however were great youkai who possessed divinity and were recorded as "Futatsuiwa Daimyoujin" (二ッ岩大明神). Mamizou has brown eyes and light-brown, shoulder length hair. She is featured with tanuki ears and a giant striped tail. 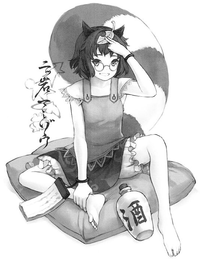 On her head there lays a green leaf like that of a tanuki and she has glasses. She has a ecru shirt and her skirt is red-grey with some patterns on it. As with most bake-danuki from Japanese myths, Mamizou carries things on her back that look like a bottle of sake and a booklet of promissory notes. In Hopeless Masquerade, when she gets hit or performs certain attacks, she can be seen wearing grey bloomers. When visiting the Human Village she uses a human disguise, without her raccoon ears or tail. In this form, she has long hair, a checkered scarf and large robe, and wears a leaf-shaped hair clip. 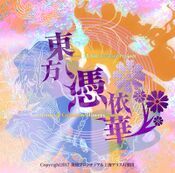 Mamizou has the title "The Bake-danuki with Ten Transformations" with theme music "Futatsuiwa from Sado". Mamizou is secretly called in by Nue Houjuu from the outside world to become a strong ally on the youkai side against Toyosatomimi no Miko and her faction. She arrives late however and Miko had already been defeated by the heroines. She later takes up residence at Myouren Temple. In Reimu's story, Mamizou reveals that she crossed the sea of Sado in order to reach Gensokyo and criticizes Reimu for underestimating the vastness of the sea. Mamizou sees through all of Marisa's lies. She also notes that her power is strong enough to be "within the top three" of the transforming tanuki in Japan. Despite Sanae's mission to exterminate youkai, the two appear to have a friendly duel. Sanae, though, assumes that the bake-danuki is fairly old due to her language—many of the inflections and word choices used by older people in Japan resemble those used decades, even centuries, ago—and in this misunderstanding gives the youkai some encouragement. Mamizou tells her that her old language is merely a habit. Mamizou tells Youmu that she came to give the youkai there some encouragement in their fight against Toyosatomimi no Miko. She offers to train Youmu, and after she is defeated, jokes that the half-ghost is worthy to be her apprentice. Mamizou does not appear to know about the Myouren Temple itself until Youmu explains, and finds the presence of both a youkai temple and a youkai-exterminating shrine (the Hakurei Shrine) in Gensokyo quite interesting. Mamizou invites her into the temple to rest and to talk about Sado. She plays a key role in helping all of the characters. As the penultimate boss of each character's route except her own, she directs each character to the source of the problems. Before her route, she directs each character to Hata no Kokoro. During her own route, she helps Kokoro by steering her in the right direction for creating her own unique personality. In Kokoro's route, Mamizou directs Kokoro to the final four-way fight with Reimu, Byakuren, and Miko. Later on in the game, Mamizou appears to have taken note of the wanted amanojaku Seija Kijin. She confronts her and says that the tengu (presumably Aya Shameimaru and Hatate Himekaidou) have taken notice of her and have written up a newspaper about her mischief. 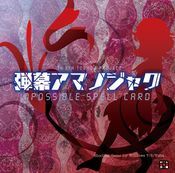 This causes stronger youkai and humans such as Marisa Kirisame, Sakuya Izayoi, Sanae Kochiya and Youmu Kompaku – including Mamizou – to try and capture Seija. Also, she notes that Seija can use two items simultaneously rather than one, which made her curious why Seija weren't using this technique in the first place. She uses spell cards that are considered impossible to dodge. Mamizou assists Kasen and the rest of the characters in setting up a trap that will draw the Outside World human Sumireko Usami into Gensokyo, with the intention of teaching her a lesson about the danger caused by her actions. In her own route, she goes to the Outside World and fights Sumireko herself. After a strange 'black mist' assails the residents of the Myouren Temple and others, Mamizou pays a visit to the Hakurei Shrine accompanied by Kogasa Tatara and Kyouko Kasodani, suspecting Reimu Hakurei as the culprit. Days later, Suika Ibuki reveals herself as the true attacker. She appears in each chapter in some sort of role, usually disguised as a human, taking an interest in youkai books and in some of the recent incidents that came about as a result of them. Her reasons for her interest and disguising herself are currently unknown. Since Mamizou lives at the Myouren Temple, she should know most of the residents living here, including the leader Byakuren Hijiri herself, although there has rarely any interaction. Kyouko Kasodani claims that Mamizou will listen to the problems and concerns of those living at the temple with open ears. 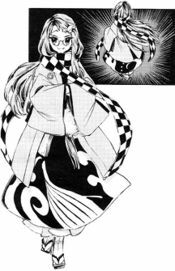 Nue Houjuu was the one to call Mamizou to Gensokyo during Ten Desires, and they are described as being friends, and are shown conspiring in Chapter 31 of Forbidden Scrollery, where Mamizou and her tanuki assist Nue in frightening the humans in the Human Village with an Urban Legend of The Bull's Head. At the end of Mamizou's storyline in Hopeless Masquerade, she urged Hata no Kokoro to, through battle with other characters in the game, learn how to control her emotions and to "discover herself" instead of becoming a mere tsukumogami for Sarugaku masks. 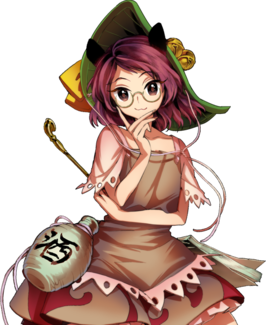 In Forbidden Scrollery, Mamizou – disguised – has become a regular customer of Kosuzu Motoori with an interest in the Demon books and talks with Kosuzu warmly. While friendly, her true reasons are currently unknown. Kasen and Mamizou first meet at winter after the events of Ten Desires during an incident where a mysterious black mist was attacking the residents of Myouren Temple, which resulted to be Suika Ibuki. Later, during the beginning of the Urban Legends incident they found a man-faced dog and tried to find a reason for these ocurrences appearing in Gensokyo. During the peak of the incident they confronted twice, when Mamizou found Kasen opening a hole in the barrier to the Outside World and made a deal with her to keep her mouth shut and look after potential intruders while Kasen was gone. 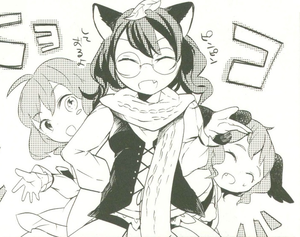 Later Mamizou decided to play as the villain and decided to interfere with Kasen's plan to fight the responsible of the incident, Sumireko Usami, with the benefit to move easily around the Outside World. She tricked Sumireko to explore Gensokyo and, in the meantime, put in motion Kasen's plan to scare her while she wandered freely. Then, with Reimu aprehending Sumireko, Kasen and Mamizou confronted her and Mamizou promised to look after her. As seen in Wild and Horned Hermit, Mamizou became worried of Kasen's influence over the Hakurei Shrine and how obviously she was an oni so she set some oni repelling traps to provoke Kasen. 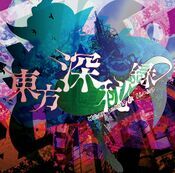 After seeing this, Kasen organized a flower viewing event at the shrine to confront Mamizou in a drinking contest. Kasen won the contest and earned Mamizou's respect. They attend another event where they drink together in Visionary Fairies in Shrine. 変化「鳥獣戯画」 Fifth Duel "Scrolls of Frolicking Animals"
Mamizou is the first female character in the Windows series to wear glasses. The first in the entire series is Rikako Asakura from the PC-98. In Ten Desires, whenever she launches an attack her leaf playfully flaps on top of her head. A bake-danuki of proper upbringing. An unusual youkai that lived outside of Gensokyo. She's made her way inside this time to help out an old friend in a pinch. Tanuki take great pleasure in watching the reactions of humans that they trick, so they seldom do direct damage. They are more powerful on the night of a full moon. Their ability to shapeshift makes them similar to the nue in a way. Neither of them seem to be terribly effective youkai when it comes to close combat. Can this kind of youkai really hold her own against Miko? After all, youkai are fairly self-centered and don't take or give orders easily, so no matter how strong each one of them may be, they'd still lose in the end. It seems she'd lived together with humans in her home town (Sado). Sometimes she'd trick them, but she'd also lend money to the poor and worked diligently on any task she was given, so she integrated well into human society. However, She doesn't get along with foxes, so it is rumored that no foxes live in Sado. She would end up causing trouble with the foxes of Gensokyo, but that's a story for another day. Humans turn emotionless when it became the dead of night . The cause for this was that out of the sixty-six masks of the menreiki, one of them, the Mask of Hope, had been lost. It seemed there were several solution strategies being advanced. When she heard about them, she went to the religionists to ask about what happened afterwards. She’ll crush you together with her bake-danuki underlings. The bake-danuki will retire as they get hit though, so as you fight please use them roughly only in moderation. Her Occult Attack is “Alien Capsule”. By carefully arranging underlings who’ve been put into capsules, you can freely counter-attack at any time! It's in both of our best interests." A youkai tanuki general who came from the Outside World. Those who master the possession battles will master the incident itself. She aims for the title of the strongest Perfect Possessor, with a partner whose interests align with hers. Her "strength in numbers" fighting style using her youkai tanuki is superb, but if you don't take care of her minions, they'll get knocked out and she'll be left all alone. ↑ eyamaki (5 April 2010). "Secret Sado #2 - Aikawa Yamaki Hotel Blog". Retrieved 15 August 2011. ↑ Asiatic Society of Japan (1908). "Transactions of the Asiatic Society of Japan, Volume 36". The Society. Retrieved 15 August 2011. This page was last edited on 4 April 2019, at 15:42.